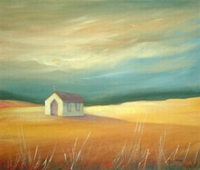 Hester lives in the Eastern Cape and her work have a rural feeling. Light is the main issue and to her colour is the emotion of nature. 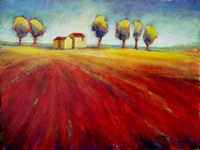 It is in the beautiful mountain district of the Eastern Cape that the artist Hester Hattingh has learned to capture the right amount of light and balance when she paints a landscape, with deep blue mountains and vast yellow planes of grass.She maintains that "colour is the emotion of nature" and one can feel the deep emotion that flows through her paintings.She has included many aspects of farming lifestyle in her works like donkey carts, shepherds, and wheat lands which gives her works a rural quality. This brings back happy chilhood memories of visits to the family farm. LEEF DEC 2007. An artical about her work and life as a farmerswife.